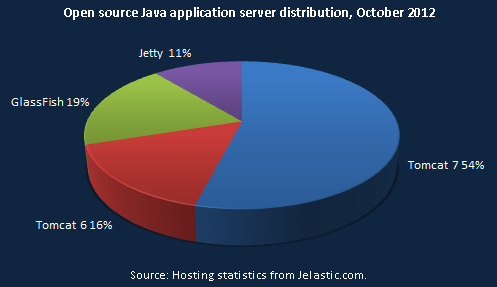 Over the last year, every month we have shared with you statistics on database, application server and Java version popularity. Today is our 1 year anniversary post. So, let’s dive into it and compare the changes in stats over the last year. As usual, let’s start with the databases! 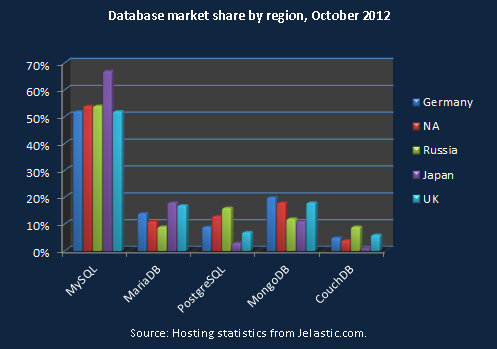 Below is the popularity of MySQL, MariaDB, Postgres, MongoDB and CouchDB among developers on Jelastic in October 2012. As you see the leader is the same, but comparing with the previous month it has lost market share: a 10% decrease over September. If we look at the database popularity by region, we see that Japanese developers have different database preferences this month. 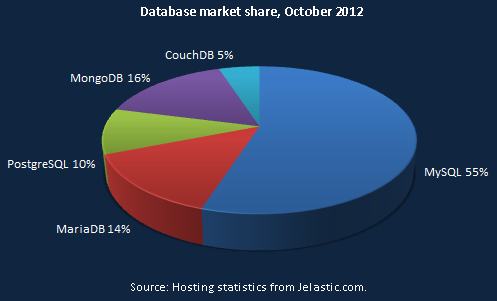 Below is a chart showing database usage within Jelastic during last year. 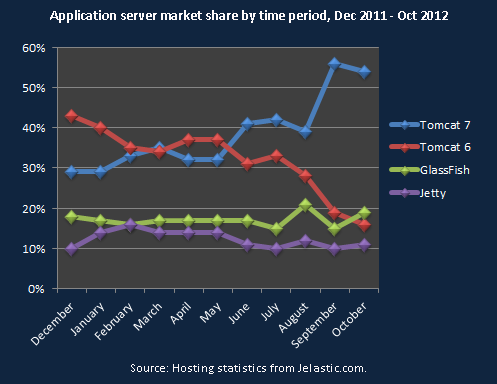 If we look at the percentage share of application servers, we can see that Tomcat 7 continues to be the number one choice. But this month GlassFish shows some more growth: a 4% increase! 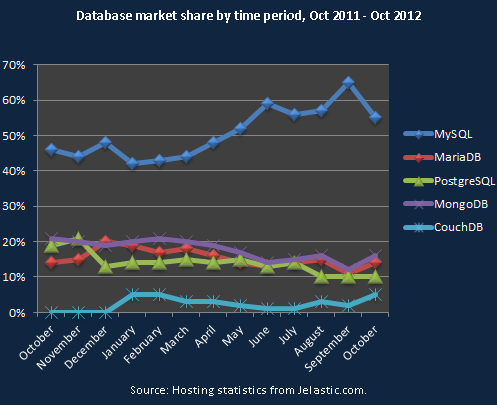 Below is the chart showing application servers popularity by region. 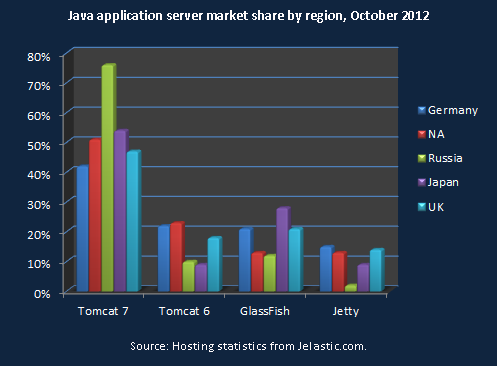 Russia developers differ a little from everyone else: there, Tomcat 7 has even more fans than in other countries. Now, let’s see the trends over the last 10 month! As you see Tomcat 7 continues to grow from month to month. 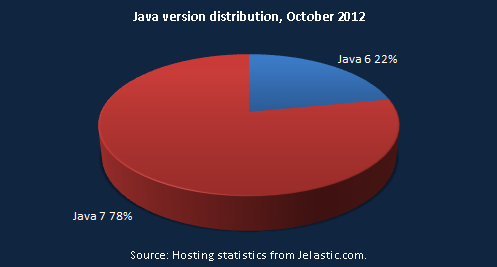 Java 7 continues to grow in popularity on Jelastic. It has a 3% increase over this month. 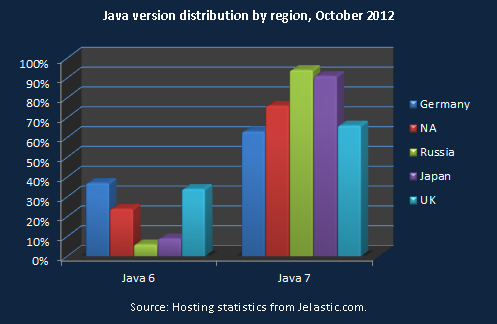 Let’s look at the JDK popularity by region. We see that the usage is about the same in the different regions. 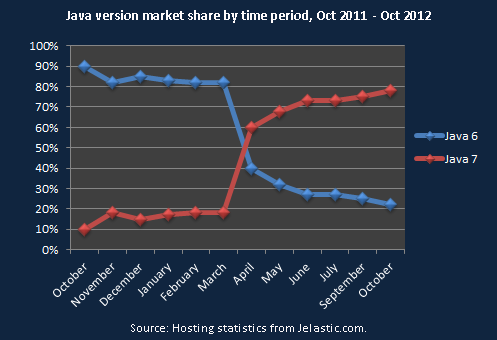 Finally, here’s a Java version popularity chart for the last year: from October 2011 through October 2012.